2016 is gearing up to be the tiping point for nonprofits seeking to generate a positive ROI from their social media efforts. The bygone era where social platforms were disparate and misinformed board members insisted that social marketing was not a viable marketing strategy for 501Cs is now an exception to the rule. , We’re now witnesses to an era with rock-solid social automation platforms, upgrades, and functionality that will enable NPO’s to accelerate their marketshare and growth in the coming year. Still, the world of social media changes quickly, with dozens of new platforms arriving each year and most existing nonprofits scrambling to stay ahead of the game with new features and innovations. If history and some recently emerging trends are any indication, 2016 will be a host for a variety of new trends and changes in the social good scene. 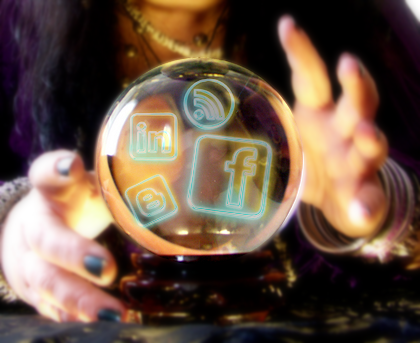 Here are 6 disruptive social media marketing trends we predict we’ll see transforming the nonprofit landscape in 2016. Real-time updates will be dominating force. Social media is already “real-time” by nature, but there are some posts that are more “real time” than others. For example, take Periscope, recently purchased by Twitter—Periscope allows users to give a live video broadcast of some stretch of their lives. This could be hihhly useful for nonprofits broadcasting via a live event, fundraiser, race, etc. Compare that to just taking a video and posting it days later—Periscope users collectively watch 40 years of live video each and every day. Your nonprofit’s volunteers and members can be a driving force behind real-time video promotion of your nonprofit. Instagram and Snapchat also support real-time updates as opposed to after-the-fact retrospectives, and could dissruptivly herald in a new age of immediacy in nonprofit social media promotion. If it catches on, you can catapult above your NPO competition who simply schedule all of their cause’s social media posts in advance. Buy will be the new donate - Facebook and Pinterest are just two of the platforms that gained attention this year by introducing new “buy” features for their advertisers and users. Mobile users of Facebook and Pinterest who see a nonprofit product they like in a sponsored post can now use one click to purchase it, without ever leaving the app. Instagram isn’t far behind on the trend, and I imagine more social platforms will follow. By the end of 2016, most major social media brands will feature some kind of buy button naturally as an element of their advertising campaigns. Creatively using "buy" as a call to action and tying a donation into the buying process can further elevate your fundraising efforts. Partnering with retailers and brands will be key. Amazon will be a significant player in the space. Keep your eyes open for this trend, its going to be a game-changer. Inter-App publishing will proliferate - Facebook is the king of adding new functionality. In the past year, they’ve introduced Instant Articles (a new form of publishing), an in-post search engine (to find articles you’re referencing), and videos that play instantly when scrolling. Now, they’re developing their own digital assistant. Other platforms are working similarly, with Twitter, Instagram, and others trying to expand their platforms to a similar degree, preventing users from ever leaving the app. In-app cause related content and engagement will continue to increase and enable NPOs to recruit volunteers, members, and funders with in the leading social apps straight thru the funnel – from awareness to acquisition. Expect this trend to continue well into 2016, giving nonprofits further opportunities to engage with their audiences on one platform. Inbound marketing will soar - Facebook’s Instant Articles are only the beginning. Nonprofits on board with the program can publish full-length articles to Facebook users, without having to link to an external source, it will become critical to nurture funders in-app, e-mail, and on the their site. As social platforms become more competitive and more aggressive about keeping users in-app for as long as possible, platforms such as Hubspot will enable nonprofits generate qualified marketing leads and convert them into donations, volunteers, and memberships. Twitter’s upcoming Project Lightning will put publication in the hands of the nonprofits and their constituents. Leveraging an automated inbound marketing platform will enable provide nonprofits a dynamic way to present material to the public via a network of engaged advocates armed with content that is highly relevant to their cause. Location targeting will take hold - With more and more apps and GPS connected devices out there, marketing will rely on connecting to people when they are out and about based on exactly where they are. Scrolling Facebook at the mall? It’s a perfect time for a push notification or update from a store within the vicinity. Is your friend at the mall too? You’ll start seeing more of his updates in the feed. Location targeting is power and it isn’t only for huge retailers. Local businesses can tap into this too. Employee advocacy will boom - Strength in numbers is what makes employee advocacy so important. Employers are now getting their employees to be an active part of their corporation’s social media game and empowering them to share about their business to create a positive branded ripple effect on the web. Because brand pages get less action than personal pages, employees can really optimize their reach through personal connections. Nonprofits have an opportunity to tap this trend to their advantage so employees and volunteers associated with your cause can further amplify your NPO’s voice and mission. All these roads lead to Lead Generation. The new 2016 buzzword nonprofits will be embracing as they seek to nurture their social media traffic into their marketing funnels and convert them into lifelong funders, members, and advocates. Marketing automation and CRM integration will be integral to this process and we will see an increase in adoption of full-service platforms such as HubSpot to enable success across the NPO marketing mix. We have already seen a significant uptake of such integrations with our clients in Q4 2015 as they get their social platforms and systems in place for the new year. For those smaller nonprofits, low cost platforms such as Sprout and Buffer will also become more prominent in the social space. Cheers to a happy, healthy and socially successful 2016!